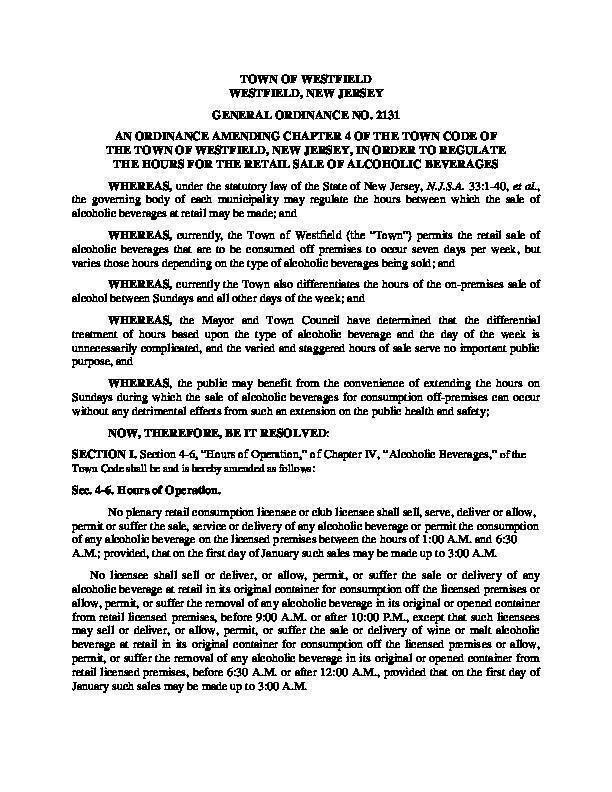 WESTFIELD, NJ — You may now buy a bottle of Jack Daniels before noon on Sundays in the town, but for the past 23 days, it has technically been illegal to buy mimosas before 9 a.m. at local restaurants and bars, something set to change Tuesday. The Town Council revamped its liquor law so the public is allowed to buy alcohol unopened and in its original containers — known as packaged goods — before noon on Sundays, but in doing so inadvertently changed the 6:30 a.m. allowable time of sale at restaurants and bars to 9 a.m.
Municipal officials had to wrangle with a complex set of state and local regulations, the town’s attorney told the council recently. The council adopted the regulation update on March 12 at which time it also introduced a measure to move the start time for the sale of alcohol at restaurants and bars back to 6:30 a.m. The council anticipates adopting the second update after a public hearing next Tuesday. There has been no public discussion of enforcing the updated morning liquor sale start time at restaurants and bars during the 29 days during in which it is anticipated to remain in effect. If you find any of these updates even remotely confusing, you are not the only one. Read the latest proposed regulation update here . Read the original regulation here. The Town Council has set a public hearing on the latest update for Tuesday, April 9, at 8 p.m. at the Town Hall, 425 East Broad St.
Below, view the municipality's recorded live-stream of the March 12 Town Council meeting at which the updated local alcohol law was introduced.